Nigeria’s historic women’s Bobsled and Skeleton teams who for the first time qualified for the Winter Olympics, have secured a major sponsorship deal with Star Lager, one of Nigeria’s leading beer brands and one of the country’s biggest sports sponsors. 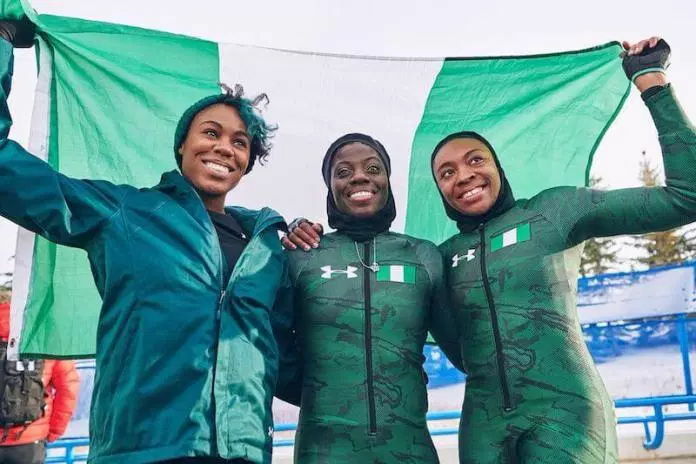 The Nigerian Bobsled team is composed of the trio of Seun Adigun, Akuoma Omeoga, and Ngozi Onwumere, while Nigeria’s Skeleton athlete, Simidele Adeagbo, would all be flying the country’s national flag at the Winter Olympic Games. Marketing Director of Nigerian Breweries Plc, Franco Maria Maggi, praised the professional manner the Bobsled federation has conducted Nigeria’s plans for the Winter Games so far. “Nigerian Breweries Plc appreciates the professional conduct and support of the Bobsled & Skeleton Federation and Integral & Temple Management Company which enabled this partnership to take place. “As the first lager brewed in Nigeria, we identify with that pioneering spirit of excellence that these four amazing Nigerian representatives. The zeal to go on and shine in the face of uncertainty, in an uncharted terrain, deeply resonates with us and we are very delighted to be able to support these great athletes in making this dream of participating and winning in Pyeongchang come true,” stressed the NB marketing chief.